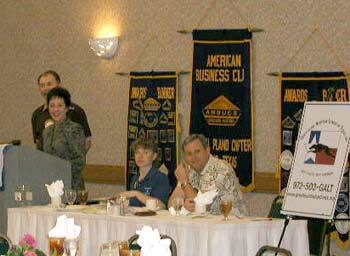 On Tuesday, November 19, Suzanne Griggs, GALT's Vice President and Secretary, gave an informative luncheon presentation to the Plano Chapter of the American Business Clubs (AMBUCS). About 30 people heard all about greyhounds and even got to see a few in person! Korkie, Xander and Maverick along with their owners, Nancy and Kristin, charmed the crowd and loved the attention. GALT's sincere thanks to Dave Hollands, a greyhound owner himself, of the Chapter for helping to spread the word of greyhounds as companion pets. If you know of a club or organization that would like a presentation about greyhounds, please email GALT.